How We Drive, the Blog of Tom Vanderbilt’s Traffic » Blog Archive » Where’d You Learn to Drive? A number of these odd buildings seem to have an unusual relationship to cars and roads (in particular, the expressways, which as the book points out were put up rather frantically ahead of the Tokyo Olympics, and thus are “mainly sited over public land, parks, the palace moat and rivers”); as the authors note, “traffic space has introduced into architecture in order to allow the execution of the highly developed goods transportation systems.” An “expressway patrol building” in Roppongi abuts directly on the freeway, its parking lot bleeding into a line of highway traffic. 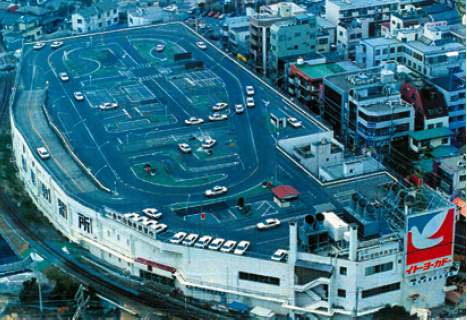 There’s a car park buried underneath a city park in Shibuya; also in Shibuya is the aptly named “bus housing,” a big apartment complex built over a bus terminal. If you went looking for a driving range (golf, that is) in Meguro, your best bet would be the roof of the taxi office. In Nishikahei, meanwhile, there’s a set of tennis courts within the spiral interchange linking the expressway to the Kannana (seventh) traffic ring road. And at the giant AutoTech department store in Kitamachi, you can head to the store’s in-house bowling lanes while you wait for your car to be repaired. Not to mention the famous automated parking garages, for cars and bikes alike. This entry was posted on Monday, April 27th, 2009 at 1:34 pm	and is filed under Cities, Traffic Culture, Uncategorized. You can follow any responses to this entry through the RSS 2.0 feed. Both comments and pings are currently closed.